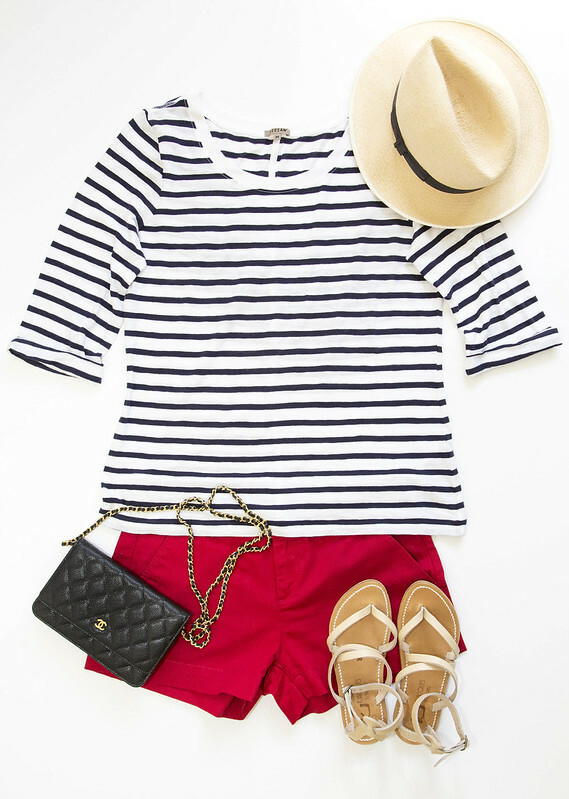 Outfit: Jigsaw t-shirt, Hackett panama hat (similar here), Uniqlo shorts (similar here), K.Jacques sandals and Chanel WOC. Outfit: Jigsaw t-shirt, Isabel Marant Étoile skirt and See by Chloe ankle strap sandals (similar here). Outfit: Isabel Marant Étoile utility jacket (similar here), Jigsaw t-shirt, 7 for all mankind denim cutoffs (similar here or just snip off any old jeans), K.Jacques St Tropez and vintage Coach bag. Outfit: Chanel bouclé jacket, Jigsaw t-shirt, James Twiggy jeans, Nicholas Kirkwood heels, Chanel WOC, Hermes Cape Cod watch and Monica Vinader Riva bracelet. Outfit: Zara blazer, Jigsaw top, Hermes Kelly 28cm, Zara boyfriend jeans, vintage Hermes belt and Nicholas Kirkwood heels (similar here). What do you call someone who's addicted to stripes? A zebra. I'm starting to look like the two legged cousin to the dual colored equine at the rate my obsession is going. I started off earlier in spring winter spring um....yes, most definitely spring, according to my Gregorian calendar with a fixation on getting a lightweight striped top. The Isabel Marant Étoile "Felix" top was desirable but the £110 made me pause......indefinitely. This was soon followed by an Armor-Lux linen t-shirt at £50. I thought I hit the jackpot with this Jigsaw top at £35 but good ol' Uniqlo came up with their version yesterday at a mere £12.90. With the schizophrenic/PMSing weather that can't decide whether to shine or rain, my only attempt at breaking out in spring/summer clothes is arranging bits and bobs on a piece of cardboard. Shockingly enough, there are a few bright colors radiating from these photos. Yeah, I know.....pretty shocking especially from a person who thinks the color wheel consists of 3 neutral hues - grey, navy and black. I love striped tops - my wardrobe is overflowing with them, and now I'm tempted to get a couple more! Beautiful outfits. All hail the striped top! I have several variations and love to build looks with them. I love each of yours. You're making me want red shorts now! I know, I'm french.. but I do have several (yes several, do not dare to count..) striped top (and jumpers...) in my wardrobe, most of them from Armor Lux but also some from Le Phare de la Baleine. I wear them either with skirts at the office or with my more casual outfits on the week end, i have several colours. Weather wise, I am right now wearing a wool turtleneck plus a wool tee shirt inside (plus a wool dress...). But I stopped shopping (for clothes) which is good for my wallet, isn't it? Granted I wear socks and a large cashmere to sleep too! And I I am "fortunate" enough to be allowed, because of the weather, to wear my leather jacket. If ever I am happy or a purchase, this is one! I do not regret the splurge neither the money spent. Among all your "looks", the one I prefer is the one with the Chanel jacket, because of the colour. This post is brilliant for me Marlene I was in desperate need of some inspiration. I love my striped tees but always seem to wear them one of two ways! I love the combinations that you have styled here. Some real inspiration and so I'll be bringing out my old Breton tee tomorrow and wearing it to work with my favourite bell bottom trousers. Watch this space. I wouldn't think to wear a striped top with that IM skirt but I think it works - it's playful and a simple way to mix prints. 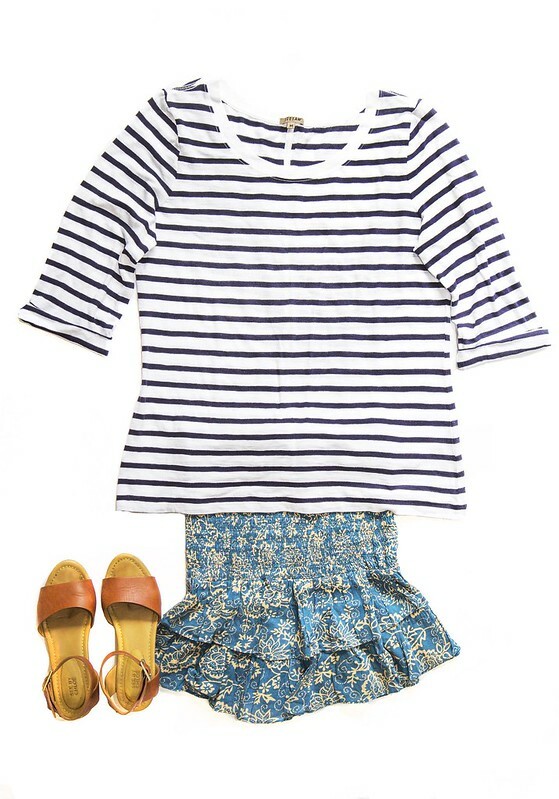 Besides, a breton tee goes with everything, right? love the entire outfit/look! awesome choices! xO!